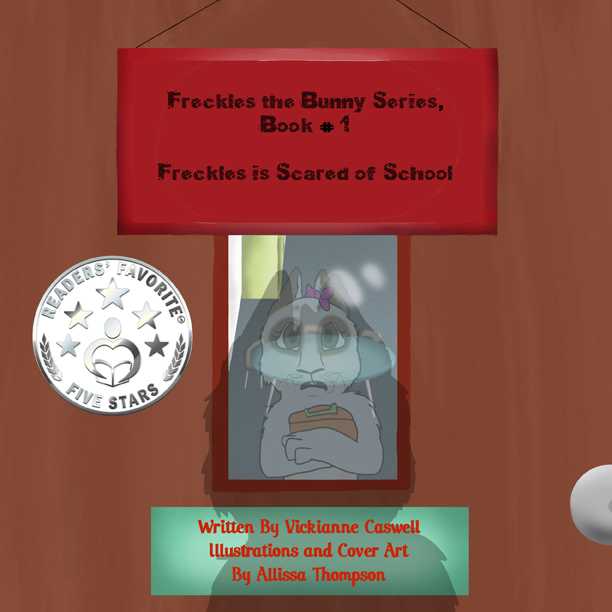 Reviews of "Freckles is Scared of School"
Freckles loves being at home with her mom. The day her mom tells her that she must go to school, Freckles is both scared and upset. At school, she learns that things are not as scary as they seem and even makes a few friends. Meet Boots the kitten, he can’t stop grooming his paws. Dreamy the chick, she loves to nap. Tiger the puppy, thinks he’s a cat. Norma the fawn, she is shy and can move fast. Lastly, there is Donut the duckling and he loves to do everything in a circle. The books are based on of the author’s real-life pets that have their own special personalities like you will find in the books. The books contain not only funny parts for both parents and children to laugh at, but a lot of unique additions that you may not find in most children’s books. Learn more about where ideas for the stories came from, the unique things the pets did that were added to the story, animal facts and more! Signed by Freckles & the author (Freckles' paw print is stamped personally, into the book). SOFTCOVER: 28 color illustrated pages. 8.5 x 8.5" size. Ages Pre-K/Kindergarten and up. This is a great book for parents to read to their preschoolers to prepare them for the beginning of the school year, or for teachers to read-aloud during those initial anxious first weeks of Kindergarten. Wonderfully written and illustrated in delightful animal characters this tale will find its way into the hearts of preschool age children everywhere. Freckles fears school and doesn't want to go. But at her first day at school, she finds new friends and enjoys the activities so much that she doesn't want to leave. This book is a good way to introduce children to the activities of school and makes it less intimidating. Love the characters and the fun illustrations!